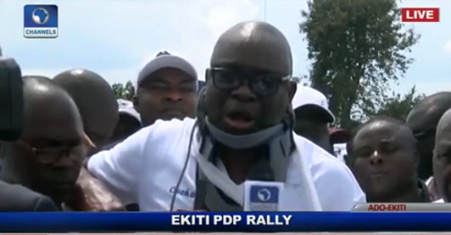 Gov Ayodele Fayose today broke down in tears as he spoke to reporters at a PDP rally. The Governor claimed he was slapped and shot. He disclosed this shortly after pictures of him circulated online that he slumped when he was teargassed and taking to the ground. “They (the police) are beating anybody who has any sign of PDP on them. They are not picking our calls; they’ve made up their minds to do this evil. I am in pain, I am in severe pain. I can’t turn this neck anymore. If anything happens to me, the Inspector-General of Police should be held accountable,” the governor told reporters while crying at the rally.